Grand Central Terminal: I’ve always loved the iconic image of the hazey light beaming through the windows of Grand Central Terminal. Those old black & white images will never be reproduced because (1) skyscrapers now block that exact light from shining through the windows at that position, and (2) GGT is now a ‘smoke free’ place and so the cigarette & cigar smoke that mainly created the haze in the original photo will be never more. The original photo shows the light coming through the top windows over the American flag in the right of my image. My homage to mid-century NYC when GCT was the smoke-filled starting and stopping point for NYC commuters of that era. p.s. : day 2 post. this was taken on a day shooting about GCT & NYC with Steve Beal (www.stevebeal.com), Brian Furbush (www.brianfurbush.com), Brian Matiash (www.brianmatiash.com), Bob Lussier (www.lussierphoto.com) & Jesse Pafundi (www.goldenhourstudios.com). Posted on Monday, September 12th, 2011 at 4:11 pm. 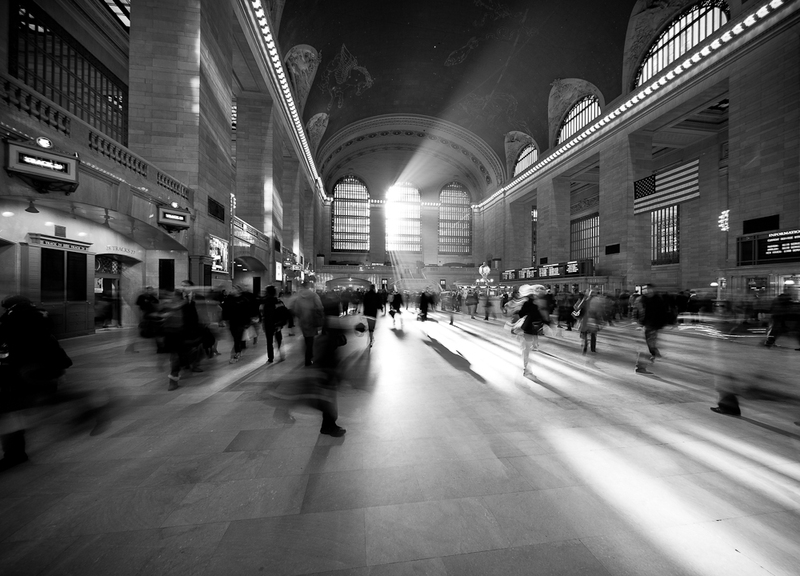 Filed under: Black & White, Grand Central Terminal, New York City Tags: b/w, black and white, central, city, commuter, GCT, grand, Grand Central Terminal, haze, new, New York City, NYC, shadow, sunlight, terminal, york	RSS 2.0 feed. Great example of photography Chris! Preserving things as they once were and will never be! Love your use of black and white and the strong feeling of movement in this shot. congratulations! That light streaming in is awesome. Even though it is different, as you noted, it does manage to evoke those earlier images. Love how this came out dude! Awesome. I love everything about this image. Love the light and haze in the image! Beautifully done! LOVE this shot, Chris. Love it.